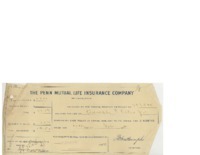 Subject contains "Penn Mutual Life Insurance Company"
Life insurance receipt for William Van Dyke Ochs. Notice of premium for Adolph S. Ochs Jr's life insurance policy. Life insurance certificate for Adolph S. Ochs Jr.